Aspirin and paracetamol (acetominophen) are the commonly available non-opioid analgesics for the management of mild to moderate pain (Table 2). These compounds have peripheral mechanisms of action. 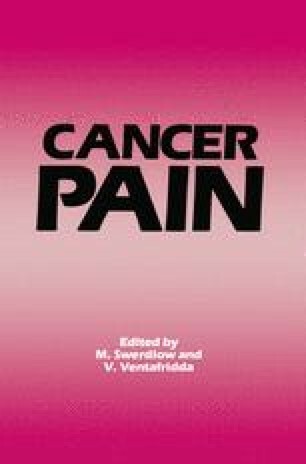 Aspirin is especially beneficial in metastatic bone pain where commonly there is a high local concentration of prostaglandin produced by the tumour cells. Aspirin provides pain relief by blocking prostaglandin biosynthesis; it also has anti-inflammatory and antipyretic effects. In patients with bone pain who are intolerant of aspirin, one of the non-steroidal anti-inflammatory drugs (NSAID) commonly used in arthritic conditions should be considered (e.g. ibuprofen, naproxen, diclofenac, indomethacin). Repeat doses of NSAID give a plateau effect beyond which increasing amounts produce little or no additional relief.